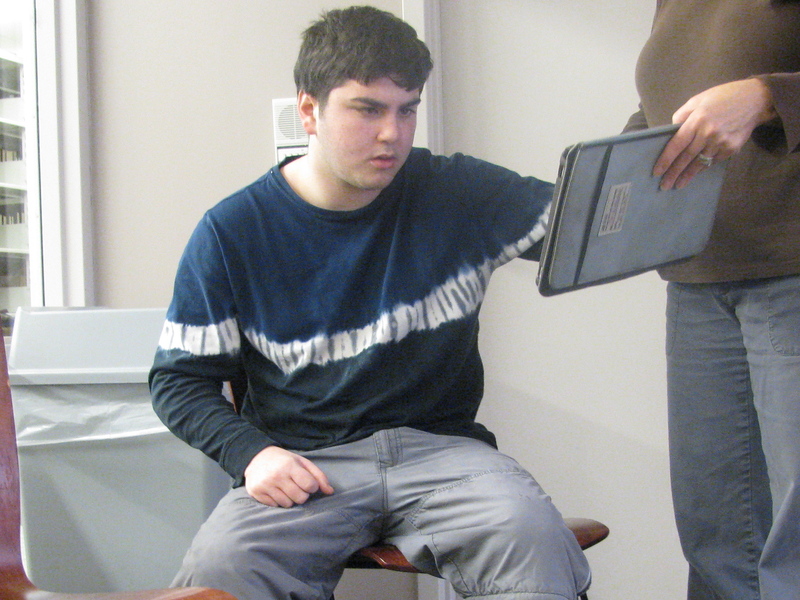 The article focuses on questions Clay raised during a session with his typing teacher. Tough questions. The kind of questions the parents of a kid with autism have a hard time facing. You can read the article here. Did Clay have any further thoughts on those questions? “still so sorry about making you cry,” he typed for his Mom. Any advice for other kids with autism who are struggling with what the future holds for them? Pearls of wisdom, as usual. For first time visitors to this blog, I’m going to take the author’s prerogative of pointing out some entries from the past two years or so that you might find interesting. “So Proud” – an account of the first time Clay presented to a class at Arcadia University. “Typing King” – an account of the second time Clay presented to a class at Arcadia University. “Yo, Adrian” – Clay’s first horseback ride. “A New Buddy” – the day we brought home Clay’s Christmas present. Welcome to Life With Clay. This entry was posted on March 15, 2012, 7:38 am and is filed under Communicating, Daily Life. You can follow any responses to this entry through RSS 2.0. You can leave a response, or trackback from your own site. Thank you so much for this. I face all this myself with my son age 20. You expressed my feelings exactly. Love the article, and it was great reading stories about Clay and his family here. We have lots of animals on our farm… please come and visit sometime, we are not that far away! So happy more and more papers are carrying this type of story! Came over here via crazyantelope. I’ve been trying to grapple with the big questions too so reading your article was hitting me right where I’m at. Though my boy is only 5 I want to work towards that big picture all the way and have been writing about it quite a bit. THEN, reading about how Clay has learned to communicate – how incredibly inspiring! My boy also has visual processing issues, so I worry about his capacity to use keyboards and technology (totally not interested at this point), but great to see what Clay has achieved.